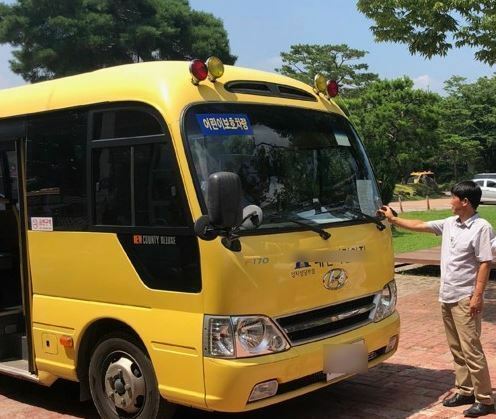 According to the ministry, it will provide 300,000 won each for the 15,000 school buses of public kindergartens, elementary and special schools across the nation to install safety devices in the vehicles. Several young children here have died or suffered harm after being accidentally left alone in vehicles for hours in scorching weather. In July, a 4-year-old died after she was left in a school bus for seven hours in Dongducheon, Gyeonggi Province, in hot weather. The Road Traffic Act requires drivers to check if all children or infants have alighted from their vehicles. But the effectiveness of the law has been questioned due to the weak punishment -- a fine of up to 200,000 won. The safety devices to be installed include motion sensors, alarm bells and a system to check for sleeping children. The system requires a driver to check for any remaining passengers and to tag NFC-enabled terminals installed on the rear seats farthest from the front as well as the interior and exterior of the vehicle. As for pick-up buses operated by private institutes, the government said it will come up with cooperative measures to install the devices. The ministry will also reinforce safety education for all students and faculty members -- to teach young children how to undo seat belts and to press alarm bells in case of an emergency. “We will provide all needed support to create a safe educational environment so that no more children will be victimized in regretful accidents caused by the carelessness of adults,” said Ryu Jeong-sub, the chief of Educational Safety Information Bureau.